You can listen to 'All or nothing' here. Pennywise or poundfoolish? Pennywise is a punkrock band that is around for quite some time. Being from 1988 that makes the celebration of its silver anniversary in 2013. For a punk band that's a very long time. But, it's getting normal, doesn't it? Punkrock has become a career and in some cases a very successful one. 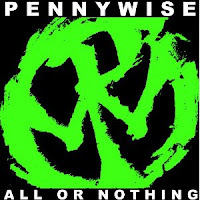 Pennywise came on my radar with the album 'About time' in 1995, roughly at the time time as Green Day and The Offspring. The new wave of Californian punk. The follow-up album was so black, due to the suicide of Jason Thirsk, that I couldn't listen to it. Too extreme, too loud, too angry. So Pennywise left my radar screen. And then in the late spring a friend said Pennywise is the leading act at Werfpop. So I decided to listen to its new album, All or nothing. Having just heard The Offspring's new album I thought All or nothing is better. Then Pennywise cancelled due to a back injury of its new singer Zoli Téglas. So I forgot the album, till the song 'Revolution' came by as my iPod switched itself to random, what happens every once in a while. What a fun song, I thought and checked the screen. Thus I came back to All or nothing. Listening to the album I wonder how is it possible that Pennywise can come up with songs that sound so good, while at the same time so familiar? This is what California LA punk sounds like since the early 90s and still this album is so much fun. It all starts with the drumming of Byron McMackin. The pace, power, energy and tightness (real or tweaked? Sorry I must ask this question here) is in such an exciting way that not even 'The Muppet Show's' Animal could have imagined it in his wildest dreams. It propels each song forward in one big gush of energy, that the rest of the band only has to follow. And does. Randy Bradbury's fingers race over the snares of his bass, cementing the sound of Pennywise. The bricks are laid by the guitars of Fletcher Dragge. At least one, mostly more, tight rhythm and one lead guitar flying in half of the time with a squeal, as if it is some sort of common law of punk rock. The roof is Téglas' voice. This guy can really sing. He doesn't seem to have to force his voice to sing punk as some of his colleagues have to. It seems to cost him no effort at all. His contribution to Pennywise seems to remain this one album, as he left the band to be replaced by the orginal singer Jim Lindberg, who's going along on tour to celebrate the 25th anniversary. Good news for the true fan, it remains to be seen if the quality is the same. It doesn't make much sense to pick out individual songs. The band starts with a tight pace and ends with in a whirlwind fourteen songs down the cd, including two bonus tracks. Some are slightly better than others, but as a whole All or nothing is a great punkrock album with loads of excitement. I've decided its all, folks!